Now that your dish has been added to our marketplace and your landing page is live, we can start selling tickets. Just one post from your Facebook and Instagram accounts will make a difference. Copy & Paste the posts below to your social media pages, change the event details to your event's, and then hit send. We can all share that post to our personal pages. On Saturday, January 26th, Chef Brian Howard will be serving an #OffTheMenu Duck Confit Cinnamon Roll. Only 50 available, reserve yours now before they sell out. We created a Facebook event page for this event and tagged your page as a co-host. Please make sure your social media team accepts the invitation. Also, you and your team should mark yourselves as GOING on the event to help spread the word. 3. Request SECRETBURGER.com Promotional Materials. 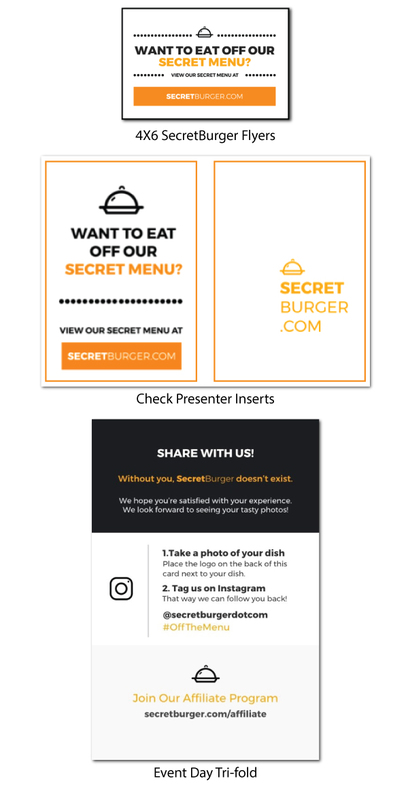 SECRETBURGER.com offers restaurants a package that includes various collateral that can be displayed in the restaurant, given to guests in check presenters or placed in t-go bags. These signs and promotional materials have no extra charge, but they do have to be requested and shipped. Please email us so we can ship them out to you right away: team@secretburger.com. Check presenter inserts and to-go bag flyers to increase awareness. 4X6 SECRETBURGER flyers to be mailed to you or emailed to print yourself. Event Day Tri-fold. Drives significant social media buzz by encouraging pictures of your #OffTheMenu dish.